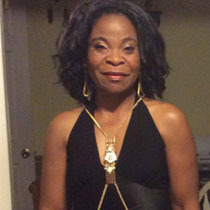 Gladys Affam Is currently a Lead Educator with a private school located in Washington, DC. She has been an educator for the past 18 years. She holds a bachelors’ degree in psychology, masters’ degree in Special Education and is currently pursuing a post graduate degree in Teacher Leadership. She has worked in various establishments- from Banking to Airlines Nigeria Airways Sales Office Manager, New York Office. BWIA, sales representative, New York Office. Ethiopian Airline, Wash. DC Managers’ assistant to Education. She is married to Mr. J. Affam from Ogbaru in Anambra State and is blessed with three children. Her Grandmother, whom she adores, is from Aku, Nsukka in Anambra State. Gladys enjoys making people laugh, travelling, assisting people in any capacity she can. My goal as an educator is to help every child I can learn how to read and be a good reader.